Making the same journey from A to B every day at the same time sounds easy, but the daily commute is full of potential “stressors” – events that trigger the stress hormones typical of our ancestors’ “fight or flight” response. The “fight or flight” response evolved to prime us for situations like being cornered by predators. Modern-day commuters aren’t at risk of being eaten, but being stuck on a freezing platform, gridlocked road or jam-packed bus can be no less stressful. In both cases, our body reacts by increasing our heart rate, raising our blood pressure and releasing the stress hormone cortisol. Women find commuting more stressful than men, a 2011 study by Sheffield University and LSE suggested, because they are more likely to be responsible for domestic and child care arrangements on top of their workload. A 2007 Nottingham University study found that commuters use a variety of coping strategies. These range from trying to make the time worthwhile by getting something done to trying to cheer themselves up. One popular strategy noted by the researchers was a tendency to look at attractive fellow travellers. The trick to overcoming the stress of your daily commute is to take steps to make you feel less like a victim and more like a master of your own destination, if not destiny. Here are 13 suggestions to beat the commuting blues. Spend a few minutes meditating. Simple exercises like closing your eyes and focusing on your breathing, or visualising a beautiful image or experience can alleviate the stress of your daily commute and leave you feeling refreshed. Try to find a calm spot in a “Quiet Carriage” on trains. Reading is one of the best ways to take your mind off whatever’s worrying you. A Kindle or other handheld tablet is ideal when commuting by train, tube or bus, even when standing. Books still work too! Buy noise-cancelling headphones and make a playlist of your favourite calming music on your smartphone or iPod. Download audiobooks or podcasts – comedy programmes are a good bet. Doing crosswords, puzzles or Sudoku can help you switch off and feel you have used your time profitably. You could also try learning or brushing up on a foreign language by downloading an app. TuneIn radio (website or app) is great for listening to foreign-language stations around the world. Email stress is a major cause of stress at work. Use the extra commuting time to delete junk or send quick replies to your most important emails. Many trains now have power points and wi-fi access – as do some underground stations –, making it easier to work on the move. A lack of control is often at the heart of why commuting can be so stressful. Is it possible to adapt your commute so that you feel more in control? The most stressful form of commuting, according to a survey by Nottingham Trent University, is cycling, followed by bus, train and car. A number of websites and apps make it possible for you to see information about your journey in real time. Both nationalrail.co.uk and tfl.gov.uk (for London transport) carry live information about disruptions. Waze – An innovative new social traffic app that reads the GPS location and speed of every person using it, and reports that data back to other users who might be travelling in the same direction. Users can also report holdups and ping other users to get real-time updates. Tube Map – A simple but useful app that shows you the status of London Underground lines. It also allows you to type in your route and calculate the fastest time. Tube Exits – A useful time-saver in which you type in the station you’re travelling to and find out which carriage to get on in order to be closest to the exit on arrival. BusChecker – As the name suggests, this lets you know in real time when buses are due to arrive. 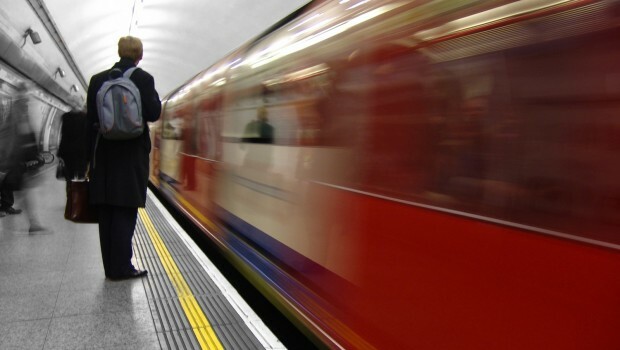 You may find it’s easier to get a train or tube seat one stop before you usually get on. Take the train back one stop if it only adds a few minutes to your journey, then get on your usual train and grab a seat. Either pool together with other drivers and share the driving and petrol cost, or even consider buying a shared vehicle to make commuting more social and less stressful. Walking to or from work, even if it’s only part of the way, is the most relaxing way to commute. There are no holdups and you can listen to music, audiobooks or podcasts. It’s refreshing, free and healthy – five fast, 30-minute walks a week meet NHS guidelines on physical activity for adults. Rushing in the mornings to find your keys, phone and wallet will add unnecessary stress to commuting. Make extra time by spending ten minutes every night getting together everything you need to leave the house. This may sound drastic, but if expensive, time-consuming and stressful daily commuting is dominating your life, is it really worth it? Moving somewhere that allows you to cut your commute will mean you have more time for the things that psychologists say really matter like a happy family life and strong social connections.